I have another chance to prove myself, and it starts right now. I'm on this show for comic relief. So, sometime at the end of June I got a box of December ARCs from the fantastic folks at Random House and thought to myself: "Wow, that is so cool! And so.. early! ", and I was ready to toss it under the bed for future reading (you know, closer to the publishing date). But before I did that, I sat down to closer inspect the books. I started reading the synopsis, etc. 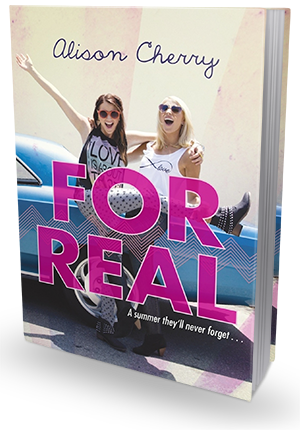 And then, on a whim, I decided to read a few pages of For Real (OK, I admit, it looked like a perfect summer read!). 5 hours and one skipped meal later, I was sitting on the couch with a huge grin stuck on my face, with my belly hurting from all the laughing. For Real, was AMAZING. For real!! Charming, clever, sharp, fresh, humorous and completely captivating! I really, truly, completely loved it. I could not believe this book was set to publish in December, and not during summer, as it was such a fantastic, feel-good, summer read! I'm really glad I got to read this book early, it really made my June! The plot line of For Real revolves around two sisters, Claire and Miranda, joining a reality TV show called Around the World in order to get revenge on the older sister's cheating ex-boyfriend, Samir. Competing in a crazy race around the world is hard, racing with a freshly broken heart and against the one responsible for your heartache is even harder, but can you imagine doing all that on a show that turns out to be a dating show? Pure insanity! I devoured this book. I could not get enough of the wonderfully captivating writing style, fantastic characters and delicious sense of humor. I loved the twists, I loved the revenge-driven plot line, I loved the hilarious and often times completely crazy tasks the competitors had to face. It was all extremely entertaining. What I loved the most, though, was probably the way Miranda and Claire's relationship was depicted. And the way it changed over the course of this story. They both learned new things - about themselves and each other. They bonded and learned to appreciate one another even more. I loved their sisterly bond! For Real sports an amazing cast of characters. Claire and Miranda are great - and so very different from each other (and I just adore Claire's snarky inner monologues - they're hysterical!). But they're not the only ones worth mentioning, not by a long shot! Will Divine is, well, divine, and also devilishly clever. Troy is hilarious, and you really can't help but grin at the things he says. Even Samir is quite an interesting character, despite the fact that he's a cheating stuck up narcissist - or maybe precisely because of that? They're all just very colorful, unique and believable, and it's all too easy to get completely caught up in their stories. Undeniably, I had a lot of fun with this book, so if you're looking for something to brighten up a gloomy winter afternoon, I definitely recommend For Real. It's a story that is both entertaining and meaningful,and I can't imagine anyone disliking it. You'll be glued to the pages, laughing out loud and wreaking your brain trying to figure out what's real and what's not.